Session Court Convicts Amma Jayalalithaa for 4 years with 100 Crore Fine, High Court acquits former CM in all in graft case! Jayalalithaa and three others were acquitted; massive celebrations at party headquarters in Chennai.Session Court Convicts Amma Jayalalithaa for 4 years with 100 Crore Fine, High Court acquits former CM in all in graft case! In a major victory for AIADMK, a special Bench of the Karnataka High Court set aside the trial court order convicting former Tamil Nadu Chief Minister Jayalalithaa in the disproportionate assets case. 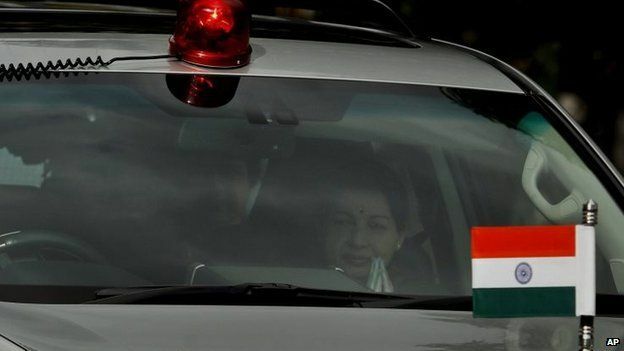 Justice C.R Kumaraswamy, who read out the judgment at 11 a.m, said the appeals of all the four accused, including Ms. Jayalalithaa have been allowed and they were being acquitted of all charges.In September 2014, she was sentenced to four years in prison and a Rs.100-crore fine was imposed. 7:10 pm: NCP leader Sharad Pawar, CPI National Secretary Atul Kumar Ranjan, TMC leader GK Vasan, MDMK founder Vaiko, BJP’s National Secretary H Raja, AIADMK allies — Indian Republic Party, AISMK, AIFB and Tamil Nadu Kongu Peravai also extended their greetings to her. 7:00 pm: External Affairs Minister Sushma Swaraj, Union Minorities Welfare Minister Najma Heptullah and Tamil Nadu Governor K Rosaiah also extended their greetings to Jayalalithaa over phone, AIADMK release said. 5:42 pm: Prime Minister Narendra Modi greets Jayalalithaa after her acquittal in wealth case. “Honourable Prime Minister Narendra Modi spoke to Puratchi Thalaivi Amma and extended his greetings,” an AIADMK release said. 5:15 pm: Special Public Prosecutor B V Acharya said the prosecution case had been “seriously prejudiced” in the disproportionate assets case against former Tamil Nadu Chief Minister Jayalalithaa and three others, as the state of Karnataka and SPP appointed by it was denied an opportunity to convince High Court through oral arguments. 4:00 pm: Jayalalithaa was entitled for acquittal as the disproportionate assets held by her was less than 10 per cent of her income as per the guidelines of the Supreme Court for acquitting public servants based on the quantum of DA possessed by them in the corruption cases. Here is the copy of the judgment. 3:40 pm: Moments after she was acquitted, AIADMK chief Jayalalithaa began consultations with senior party functionaries, including incumbent Chief Minister O Panneerselvam, over her party’s next move, at her residence in Chennai. I would like to remind one and all about Mahatma Gandhi’s saying there is a court above all courts and that is conscience,” he said in a statement. 3:23 pm: The disqualification of AIADMK chief J Jayalalithaa as a candidate in elections has ended following her acquittal by the Karnataka High Court in the disproportionate assets case, which she had suffered on her conviction last year. They, however, clarified that she will have to contest the election “again” to become a member of the legislative assembly. 1:50 pm: Former Tamil Nadu Chief Minister Jayalalithaa has issued a statement saying truth and justice has prevailed. Thanking God and the people of Tamil Nadu, Ms. Jayalalithaa says the case was a conspiracy by DMK to destroy AIADMK. 12: 22 p.m.: Justice C R Kumaraswamy also acquitted AIADMK’s chief close aide Sasikala Natarajan and her relatives J Elavarasi and V N Sudhakaran. 12.20 p.m.: TMC leader G.K. Vasan said the judgement of the Karnataka High Court acquitting former Chief Minister Jayalalithaa and others should not be viewed politically. “Our stand, eve when the trial court delivered its judgement, was the same,” he said in a statement. 11: 25 am: A pall of gloom has descended on DMK leader M Karunanidhi’s residence at Gopalapuram. Partymen expecting a judgment against Ms Jayalalithaa were disappointed and left the area one by one. DMK Treasurer M.K. Stalin and former Union Minister Dayanidhi Maran called on Mr. Karunanidhi. 11: 08 am : AIADMK congratulated in Lok Sabha by MPs after former Tamil Nadu CM Jayalalithaa’s acquittal by Karnataka HC in disproportionate assets case. 11:00 am: Jayalalithaa and three others acquitted in DA case. 10: 54 am: DMK treasurer M.K. Stalin, former Union Ministers T.R. Baalu, A. Raja at party leader M. Karunanidhi’s residence in Gopalapuram, Chennai. 10: 52 am: Chief Minister O. Panneerselvam is still at his official residence on Greenways Road. He is yet to go to Poes Garden or party headquarters. 10: 36 am: No AIADMK men in Karnataka Court complex, reports Sruthisagar Yamunan. 10: 34 am: Prosecution and defence lawyers take seats as Karnataka High Court. Proceedings to begin at 11 am. 10: 25 am: A steady increase in number of followers at Poes Garden residence of the party supremo, reports Meera Srinivasan. 10: 23 am: The Disproportionate Assets case has spanned over a solid 18 years with many twists and turns. The AIADMK vote bank and Ms Jayalalithaa’s hold over the organisations are unlikely to suffer any immediate setback even if the High Court upholds the conviction. DMDK founder Vijayakant, despite moving close to the DMK, will also seek to project himself as a right alternative. VCK leader Thol. Thirumavalavan is talking of cobbling together a front of smaller parties. DMK banks on being the most viable alternative to the AIADMK. 10:15 am: A look at the TANSI case that put the former Chief Minister in a similar position in 2001. 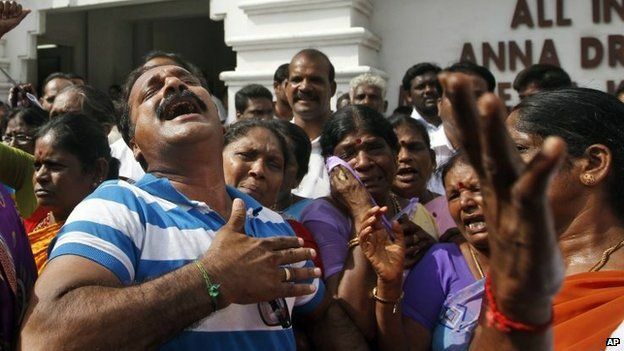 10: 09 am: Today’s verdict will decide the political future for Jayalalithaa and her party. What are the possible outcomes of the verdict? 10:05 am: AIADMK supporters line up in front of the Karnataka HC as a show of support to the party supremo. 9:55 am: Party cadres seated along pavement at Poes Garden in Chennai. 9:49 am: Unlike October during the Bail hearing, not many policemen at the Karnataka High Court for the verdict. Her absence being the reason behind the scarce crowd. 09: 35 a.m: AIADMK cadres have gathered at Sri Sangupani Vinayakar temple, Kancheepuram to offer prayers. 09: 30 a.m: Anticipating trouble by the presence of AIADMK cadres, the police have issued prohibitory orders in a one kilometre radius around the High Court. About 500 policemen are expected to be on duty to avoid trouble. In a major victory for AIADMK, a special bench of the Karnataka High Court on Monday set aside the trial court order convicting former Tamil Nadu Chief Minister Jayalalithaa in the disproportionate assets case. Justice C.R Kumaraswamy, who read out the judgment at 11 a.m, said the appeals of all the four accused, including Ms. Jayalalithaa have been allowed and they were being acquitted of all charges. With this, a case that had panned out over 18 tortuous years was over within seconds. Jayalalithaa was acquitted by the Karnataka High Court, less than a year after she was sentenced to four years and a fine of Rs. 100 crore in the disproportionate assets case. In a statement issued to the media, Ms. Jayalalithaa said truth and justice has prevailed. Thanking God and the people of Tamil Nadu, Ms. Jayalalithaa says the case was a conspiracy by DMK to destroy AIADMK. The other three accused – and acquitted – were Jayalalithaa’s close aide Sasikala Natarajan and the latter’s relatives J Elavarasi and V N Sudhakaran. Jayalalithaa was not required to be present in court during the judgment – which explained the sparse crowds around the Karnataka High Court. Her residence, in contrast, thronged with ecstatic supporters, even as some other Chennai-ites offered milk to her poster-images. What are the choices before Jayalalithaa? She can take oath immediately, and ask an MLA to vacate a seat for her and contest within six months. But she might think it prudent to wait until she is elected as an MLA, as the Election Commission is under no compulsion to hold a by-election immediately. Alternatively, she can opt for a dissolution of the House and go for fresh general election to the Assembly. What about new appeals against the verdict? It is now left to the State of Karnataka to appeal against this verdict. But the original complainant – Subramanian Swamy – can also appeal, as can DMK general secretary K. Anbazhagan (the intervenor in this case) who got it transferred to Karnataka and whose submissions were part of the record during trial and appeal. One of India’s most flamboyant and controversial politicians, Jayaram Jayalalitha, has been sentenced to jail for four years on corruption charges. Journalist Sudha G Tilak chronicles her fall from grace.Her face adorns cheap food canteens, pharmacies, salt packets, laptop computers, baby care kits, bottled water, medicine shops and cement bags in the southern state of Tamil Nadu.And if things go according to plan, a chain of frugal supermarkets and cinemas will soon bear her picture and the moniker Amma (Mother), as she is more popularly known to her followers.Her fall from grace ironically comes months after her regional AIADMK party bravely stood up to the Narendra Modi-led BJP surge in the recent general election.Ms Jayalalitha’s resounding victory – AIADMK won 37 of the 39 parliamentary seats in the state – was attributed mainly to her reputation as an able administrator and a welfare populist. Many believe the former film actress-turned-politician is possibly India’s only contemporary leader who has successfully built up a near-indelible personality cult through welfarism – or her inexpensive Amma-branded food, water, salt. No wonder subsidies make up more than 37% of Tamil Nadu’s revenue spending.”Brand Amma is emerging as the mother of all welfare schemes, offering a ready refuge from inflationary anxieties and serving to affirm Jayalalitha’s stature as an epic hero – a little vain and flawed but, in the end, larger-than-life,” says columnist V Shoba.Following her imprisonment last week, her grief-stricken supporters have held protests and wept openly. Her replacement – party faithful and former minister O Panneerselvam – also wept during his inauguration, with colleagues saying they were in mourning.To her millions of followers, Ms Jayalalitha is also Adhiparashakti – also the title of a 1971 Tamil language film she starred in – or the “omnipotent female power”.Party posters have featured her as an avenging female goddess and a no-nonsense woman in India’s male-dominated political culture. On the ground, she is Amma, the chief patron of munificence.”The Amma cult in Tamil Nadu is based on a transactional political culture in which the leader asks for support in exchange for grandiose individual acts of benevolence,” says political analyst Siddharth Varadarajan.Ms Jayalalitha’s life is a biographer’s dream – a young girl whose standout memory is of her father taking his life; a bright student who was a favourite of nuns at her convent school; an alluring movie star who acted in more than 140 films; and a successful and powerful political leader, who rose to the top under the mentorship of another film-star-turned-politician, MG Ramachandran.She also had her share of controversies, one of which eventually led to her going to prison for amassing unaccounted wealth of more than $10m (£6.1m).’Personal charisma’. Ramachandra Guha, author of India After Gandhi, says Ms Jayalalitha belonged to a generation of politicians who, to quote German philosopher Max Weber, lived “off” politics instead of living “for” it.She is also, says Mr Guha, part of a tradition of politicians who converted “charisma into authoritarianism” and used “personal charisma to gain control over the apparatus of their parties”.Many believe that Ms Jayalalitha’s excesses during her first term as the chief minister of Tamil Nadu – flashy displays of wealth, blustery displays of power and vengeful attacks on political opponents – had been replaced in her current – and third term – by a more benign persona committed to public welfare.One thing which has possibly grown is the cult of personality which she has leveraged more cannily.Mr Varadarajan says the “lesson she has learned is that it is better to personalise the social expenditure of her government than to engage in individual opulence”.So is Ms Jayalalitha’s political career over? Or as Mr Varadarajan says, the “key issue is the ease and speed with which orders can be sent when a person is in jail”.The toughest test will possibly come in 2016 when Tamil Nadu goes to polls. Ms Jayalalitha will be expected to lead the party without being allowed by law to be the candidate for chief minister.So will the main opposition DMK party, itself fractious and battling allegations of corruption, be able to get its act together and form an agile coalition with smaller parties to take advantage of Ms Jayalalitha’s absence? Will the BJP be able to make inroads into Tamil Nadu by countering, as many say, the cult of Amma with an alternate cult of Mr Modi? But, as Mr Varadarajan says, Amma’s time may not be up yet. “The AIADMK will peddle the Amma cult even more because the party has nothing else,” he says. And as Ms Jayalalitha’s tumultuous political career shows, the personality cult is one most enduring traditions in India’s messy politics. 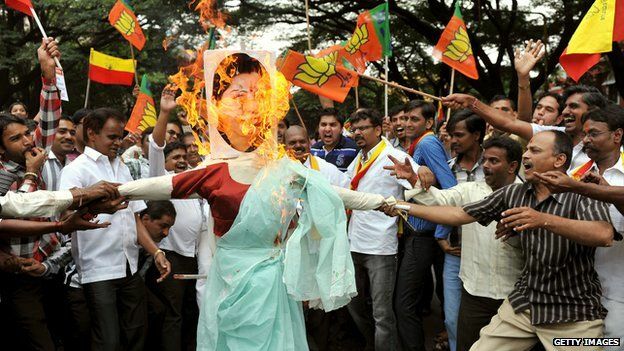 Jayaram Jayalalitha is one of India’s most colourful and controversial politicians. A former actress, her career has been marked by a series of highs and lows. Head of the AIADMK party, she has served as chief minister of the southern state of Tamil Nadu on four occasions – from 1991-96, briefly in 2001, 2002-06 and 2011 to 2014. She has alternated in power over most of this time with her great rival, 90-year-old M Karunanidhi, leader of the DMK party. In most cases Jayalalitha’s lows have been followed by dramatic political comebacks in which she has been reinstated as Tamil Nadu chief minister.The Karnataka high court order which has cleared her of involvement in a corruption scandal will also see her bouncing back from the setback in September 2014 when a trial court had found her guilty and given her a four-year jail sentence for corruption.She had to resign as chief minister and she spent three weeks in prison, and it appeared to be one of the toughest challenges of her political career.But it was not the first time she had been sent to prison for corruption – she spent a brief time in jail over corruption charges in 1996 too.Jayalalitha’s admirers say she has played a key role in the development of the state of Tamil Nadu as one of India’s most economically influential states. She has championed the cause of the rural and urban poor by introducing subsidised food canteens, providing free laptops to thousands of school pupils and students and launching other populist schemes like giving away food mixers and grinders to families. But critics say she has established a personality cult in Tamil Nadu over the years and indulged in an overtly over-extravagant lifestyle.Many publicly funded projects are named after her, such as the canteens scheme.The canteens are known as Amma Canteens – Amma in Tamil is Mother, an honorific euphemism by which Jayalalitha is addressed by her followers in the state.These were followed by other equally populist schemes like Amma Bottled Water, Amma Salt, Amma Pharmacies and more recently, Amma Cement.Her critics say that she has used the Tamil Nadu Marketing Corporation (TASMAC) – which has a monopoly on the sale of alcohol in the state – to pay for many of her pet projects.The liquor policy of the state government has been criticised for impoverishing households and ruining people’s health. The allegations made against her over the years have been extensive – from arranging for her opponents to be beaten up to spending large amounts of taxpayers’ money on lavish wedding ceremonies.Some of these allegations have veered towards the outlandish – on one occasion she was accused of losing her temper with her auditor and assaulting him.Jayalalitha first came to political prominence in the late 1980s, although she was well known as an actress before then, starring in more than 100 films.Naturally charismatic, she was brought into politics by the then actor-turned-chief minister, MG Ramachandran, with whom she starred in many of her films.Three years after his death in 1987, she took over his All India Anna Dravida Munnetra Khazagham (AIADMK) party as well as the state, and proved equally adept at retaining the political base of the party.Stories about her extravagance are legendary, and many of her worshipping followers are known to profess their loyalty through bizarre acts such as walking on hot coals or drawing her portrait with their blood.Incidents of her followers setting fire to themselves whenever she faced political setbacks are not unknown. During the various times she has served as Tamil Nadu chief minister, huge cut-outs of her figure have dominated the Tamil Nadu skyline.Her ministers have on occasions been reported to prostrate themselves at her feet. During one raid on her premises following a corruption allegation in 1996, police said they had found large quantities of diamond-studded gold jewellery, more than 10,000 saris and 750 pairs of shoes.Her emergence as an increasingly important regional politician was clearly seen in the run-up to the 2009 elections, when she threw her support behind a grouping of regional parties and communists seeking to establish a “third front” to challenge India’s two main coalitions.But throughout her career, Jayalalitha’s critics painted her as a deeply corrupt figure who has manipulated the system and sees herself as above the law.She has been in and out of the courts, defending herself against allegations.She also reportedly nursed ambitions of a greater national political role and in the run-up to the 2014 Indian parliamentary elections, her followers projected her as a prime ministerial candidate, though she did not openly endorse it. This entry was posted in Breakfast News, Featured, Politics. Bookmark the permalink.